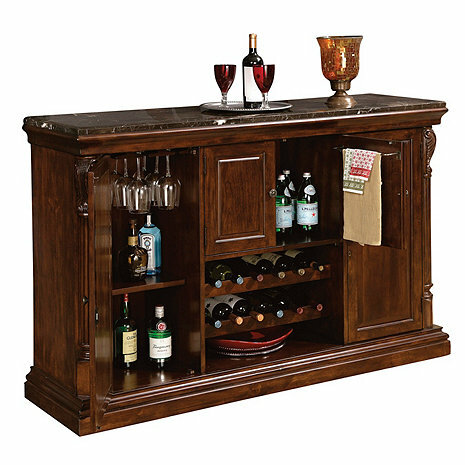 This console complements the Niagara Bar and features rare, Italian Marble laminated top which provides an elegant surface for serving drinks and is removable for easy handling. Some special features are a fixed bottle opener, removable catch basket, and towel bar attached to the inside of the cabinet's center door. Two removable wine rack rows hold up to 12 bottles*, with additional room below for serving tray storage. Finished in distressed Rustic Cherry on select hardwoods and veneers. See the entire line of . Size: 42"H x 64-3/4"W x 18-1/8"D. Comes fully assembled. *Capacity is based off using standard 750 mL size bottles, using larger Pinot Noir/Rhone size bottles may limit the capacity. Good morning, what do you mean by this? "Bar and features rare, Italian Marble laminated top" - is it not real marble? Is it thin pieces glued to something else. How thick is the actual marble...is it one piece? what do you mean by laminate? How heavy is this unit? Do they bring it in when they deliver or do they leave it on the stoop? wil be happy to help you with your purchase. This cabinet is a very nice piece of furniture with a lot of storage. It looks very nice and the marble top is a big plus. The one weakness is packaging for shipping--I had to refuse the first one because it was heavily damaged in shipping. The second one has some minor scratches in several places, which I was able to touch up with a stain pen; and the two shelves were wrapped in thin foam, but were left loose in the cabinet--resulting in some damage to the finish, fortunately on the bottom back of the shelves. The piece is very heavy and well constructed. The finish on the inside back, behind the center doors is not evenly stained or covered but you don’t see it so there was no reason to return it. The color is not at all what is shown in the picture which was disturbing when it was uncrated. The picture indicates it is a warm brown but the one I received is much darker and has a reddish tint to it. The top is as described but also a different color than pictured and the edges are differed than pictured. I like the piece but wish it looked like what is shown. The bar looks beautiful in our living room. It is a very high quality elegant piece. This piece exceeded our expectations. This liquor centre (bar unit and hutch on top) looks brilliant in our reception room. Quite the conversation piece with guests. Highly recommend.